COMPLETELY WIRELESS: Pair your smartphone or other Bluetooth-enabled device to this brilliant headset, and keep your hands free for driving, working, eating tacos or other important tasks. 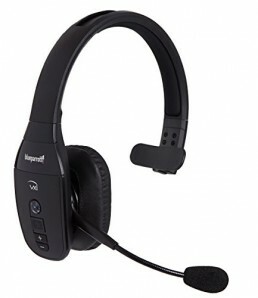 Features a soft ear pad, flexible headband and 330° swivel microphone arm. Perfect for those who do not like “in ear” type headsets. SUPERIOR NOISE CANCELLATION: Kids. Pets. That One Loud Guy At The Office. Whatever’s interfering with your call will be less of a problem thanks to your bluetooth headset’s integrated noise-canceling technology. Perfect for truck drivers, skype meetings and call centers. LIGHTER THAN AN EGG: At just 0.09 pounds, our headset is lighter than an egg. Plus, it gets far better reception than eggs, flapjacks or other breakfast foods. Gluten-free. COMPLETELY WIRELESS: Pair your smartphone or laptop to this brilliant headset, and keep your hands free for driving, working, eating tacos or other important tasks. 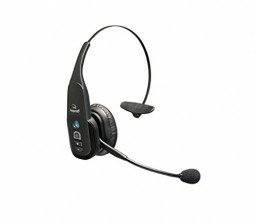 Features a soft ear pad, flexible headband and 330° swivel microphone arm. Perfect for those who do not like “in ear” type headsets. LIGHTER THAN AN EGG: At just 0.09 pounds, our wireless headset is lighter than an egg. Plus, it gets far better reception than eggs, flapjacks or other breakfast foods. Gluten-free. PAIRS WITH MULTIPLE DEVICES: Got a work phone and a personal one? Our headset pairs with two devices at once so you never miss a call. And with its 30′ roam range, you don’t even have to be able to find those phones to take a call. 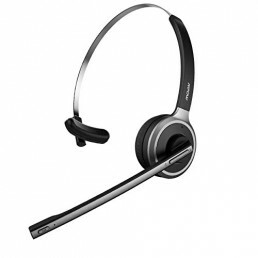 CHARGES FAST, LASTS LONG: The headset charges in about 2 hours via mini-USB, and provides up to 12 hours of talk time. It also comes with 3 years of warranty covering everything. THIS HEADSET DOES NOT SUPPORT MEDIA/MUSIC.